Quantum Entanglement between Single Atoms One Meter Apart ! A team of physicists has exploited one of the most mysterious phenomena in nature to make a major advance toward the long-sought goal of super-fast quantum computing. 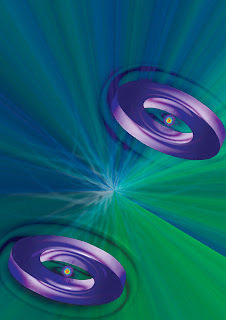 Christopher Monroe and colleagues at the University of Michigan and now at the University of Maryland established a spooky, intimate quantum-mechanical condition called “entanglement” between two completely unconnected individual atoms a meter apart in separate enclosures by carefully manipulating photons emitted by the atoms. As a result, even though the atoms have never come in physical contact, their properties are entangled: inextricably linked and giving precisely corresponding values if measured. “This type of long-distance entanglement generation is a radically new way to propagate quantum information and perform quantum computations over long distances,” Monroe says. “It should be possible to scale it up to networks of many interconnected components that will eventually be necessary for a general-purpose quantum internet.” The team reported its results in the September 6 issue of the journal Nature . Entangled entities are doubly strange. First, they have a property peculiar to the atomic-scale world of quantum mechanics: Each exists in a “superposition” of different states at the same time – like a coin with sides that are neither heads nor tails, but somehow both at once – and remains that way until a measurement forces it to take on a specific state. This aspect of quantum mechanics makes it very attractive for potential information processing. Conventional computer bits are stored in tiny capacitors, each of which can have only one of two values (on or off, 0 or 1) as determined by a measurable electrical charge. But thanks to superposition, a quantum bit, or “qubit,” can be a 0, a 1, or both at the same time. If arranged into a computer, qubits could exponentially increase the speed at which certain kinds of problems can be solved. Quantum entanglement allows the “wiring” of qubits together and is the key to such massive parallelism. Even though they are physically unconnected, entangled qubits always have complementary characteristics. If the state of first is known, then the state of the second is known as well – even when the second state is not measured. In the coin analogy, an entangled pair would work like this: If one coin were flipped and came up heads, then the other would always come up tails, even if it were simultaneously flipped 10,000 miles away. The researchers began by confining two ytterbium ions, one in each of two chambers separated by about 1 meter. Once trapped, the ions stay in their positions for several days. The atomic qubits are realized as stable states of electron and nuclear spin within each ion. The team excited the ions simultaneously with precisely tuned laser pulses so brief that each ion emitted at most a single photon as it fell back to one of the qubit states. The color of each photon became entangled with its parent atomic qubit, and the photons were guided through optical fibers. The emerging photons were combined on a beamsplitter, and quantum interference of the photons  ensures that whenever photons are simultaneously detected behind each port of the beamsplitter, the atomic qubits become entangled. This entanglement was verified by probing the trapped ions with specially tuned laser beams that directly measured the state of each qubit. Not only were correlations in the qubit states clearly visible, but the correlations persisted after each qubit state was scrambled in a particular way before measurement – a proof of entanglement. Figure 2: Schematic of experiment to entangle two remote trapped ions. Laser pulses simultaneously excite the two atoms, and their emitted photons are guided by fibers onto a beamsplitter. Whenever two photons emerge from the beamsplitter and are detected in coincidence, the trapped ions are entangled. The entanglement events were measured with extremely high efficiency, and detected with sufficient fidelity to demonstrate the phenomenon and constitute a proof of concept for controlling future quantum networks. The group has identified a number of ways to increase the yield in subsequent experiments, and improvements have recently been implemented. I'm amazed by the dexterity of these physicists who are performing such complex experiments. Only a few years back, I thought such an achievement would be impossible in next 50 years or so. I guess I'm getting too old. My hearty congratulations to Prof. Monroe and the team. If the scientists can get large groups of atoms to remain entangled somehow, then it is going to completely change every facet of our lives. Computing is just one minuscule drop in the ocean of what this could do. Energy transmission would be the big one. Imagine what we could do if we could transmit the energy of an entire power station through two small electrodes. Planes, cars, aircraft carriers, space craft.. cell phones.